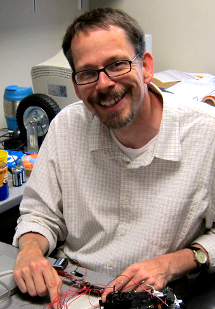 Tim Oates is a Professor in UMBC’s Computer Science and Electrical Engineering Department, where he teaches Computer Science courses like Artificial Intelligence and Robotics. He directs UMBC’s Cognition, Robotics, and Learning (CORAL) lab, which seeks to understand how artificial systems can acquire grounded knowledge from sensori-motor interaction with their environment that enables cognitive activities like natural language communication and planning. In 2001, Oates spent a year as a postdoc in the MIT AI lab. His research interests include the sensorimotor origins of knowledge, language learning, grammar induction, automated development of representation. He holds a Ph.D. in Computer Science from the University of Massachusetts Amherst.